The MKT16 is a compact console designed to provide a complete aqueous wash/rinse/dry degreasing system with a minimum footprint. The system includes two wet stations and a hot air knife dryer. Each station accepts loads up to 50 pounds and baskets up to 14″L x 19″W x 15″H. The photos below show an MKT16 designed with ultrasonics and turbo/filtration for the wash using cascading timers and MultipleRollover. The rinse stage also has a turbo/filter system installed. The dryer produces a high volume hot air stream over, under, around and through the parts as the elevator oscillates the work in front of the air knives. It is a very effective drying system. 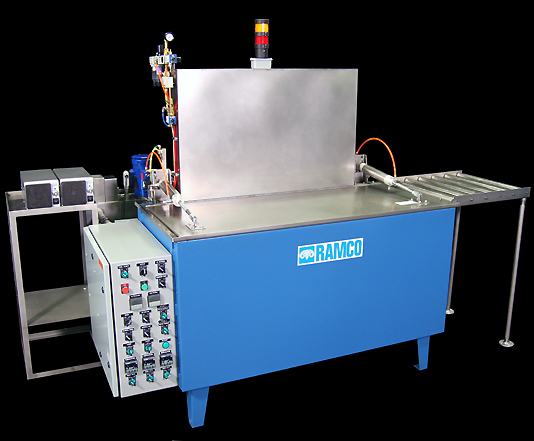 RAMCO MKT16 employs a single RAMCO Floating Cylinder to power the three transport elevators. The MKT16 employs a single RAMCO Floating Cylinder to power the three transport elevators. 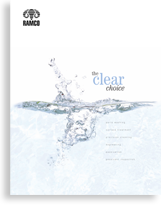 The adroit use of the elevators within each processing chamber allows RAMCO systems to achieve superior results in washing, rinsing and drying. The elevator is used to position and move the basket of components within each working zone. It is this aspect of its function that we call this Dynamic Flow Combination. The effect of Dynamic Flow Combination is better coverage of component surfaces, more consistent results and accelerated processing times. 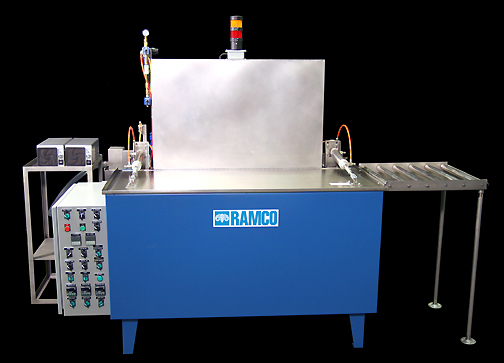 RAMCO Multi Station Consoles are built for the rigors of production. 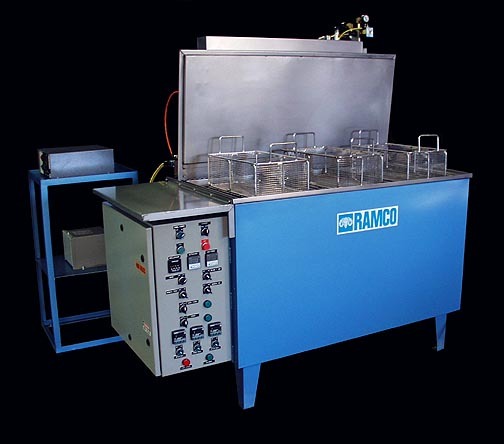 RAMCO Multi Station Consoles are built for the rigors of production. The layout is unlike conventional consoles. Nothing is placed underneath processing tanks or tucked behind “access” panels. Piping, control valves, pumps, filter housings, pneumatic cylinders, heating elements, immersibles, generators, etc. are all located outside the console, clearly visible for inspection and access. Maintenance and service are easily accomplished.